Find all your alpaca products right here! From alpaca clothing to raw wool, Animaroo Alpacas has everything you'll need. 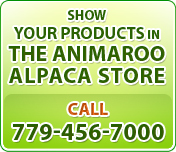 Vendors interested in selling their products in the Animaroo Alpaca supplies store are more than welcome. We're always looking for more products and great vendors. Please give us a call at 779-456-7000 to get started. Happy alpaca product shopping!